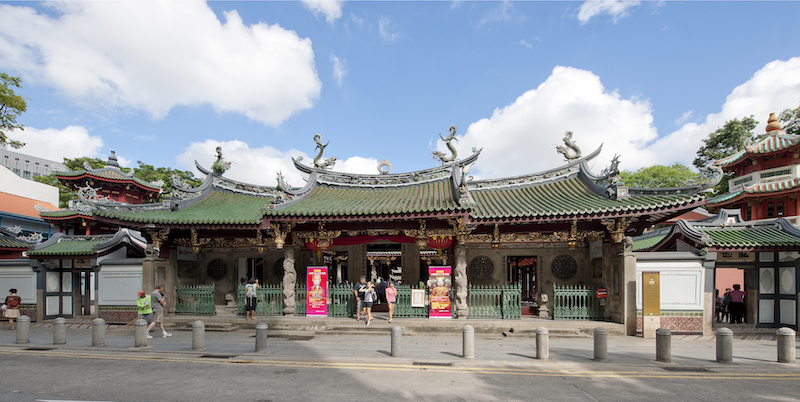 Tour at Thian Hock Keng Temple is one of the highlights of Our Telok Ayer Stories. Take another look at Telok Ayer through a different lens. As part of Car-Free Weekend, media publisher Our Grandfather Story is having installations and interactive activities reimagining the area from the 1820s till 1980s in an event called Our Telok Ayer Stories from the March 29 to 31. It not only ignites one’s curiosity in Singapore’s history but also celebrates local culture. “As storytellers, we hope to build a greater appreciation of our local culture and people through the stories we share. We’re constantly exploring new approaches to storytelling and are excited to bring together like-minded creators to present Telok Ayer’s lesser-known narratives through art installations and experiences, even for people uninterested in history,” said Ng Kai Yuan, co-founder of Our Grandfather Story. In “Our Coastline” installation, there are curated photographs documenting the coastline of Singapore. Since floods were a common occurrence in Singapore and caused by a combination of heavy rainfall, high tides and drainage problems, this augmented reality installation called “The Floor on Cecil Street, 1948” show a Singapore we are not used to seeing – men pushing their carts and trishaws and people wading through shin-high waters. The two-part installation called “Stay Golden” focuses on the Golden Shoe – a concentrated plot of financial and banking centres within the Central Business District – and draws attention to the district’s illustrious past. It also features a performance where a “glitter queen” takes visitors through the Golden era. “In Search of Golden Shoe Fortunes” Heritage Trail led by the Singapore Chinese Cultural Centre brings visitors to follow the fortunes of Singapore – from the Singapore Chinese Cultural Centre through iconic roads like Shenton Way and Robinson Road. Swing by Amoy Street to browse through decorative collections from antique collectors and artisans at “Vintage Market”. Enjoy a night under the stars in an open-air ‘cinema’ with this classic 1957 Cantonese film called “Moon Over Malaya”. Follow the filmographic journeys of the pioneer Singaporean filmmakers when you embark on the “Heritage Film Tour” where you can visit iconic landmarks in Singapore’s film-making history. Savour Chinese tea at Yu Huang Gong and interact with Masters Lee and Tan to learn more about the history and heritage of the Heavenly Jade Emperor Temple. Tour one of Singapore’s oldest Chinese temples, Thian Hock Keng Temple, with volunteers from the Singapore Hokkien Huay Kuan. There is a heritage workshop and heritage art jam with Chinese fans and tiles painting. More information on Our Telok Ayer Stories can be found at https://ourtelokayerstories.com.